How you manage your company’s content has a lot to do with the results you’re getting. However, organizing the content work has little to no value without a strategy. I talked about that in my last article and how it was key to increasing our startup's blog traffic (110% to be precise!). Today I want to help you organize your content in the easiest and least time-consuming way, but giving it the importance it deserves. For us here at Slidebean it’s so important that 5 out of 6 people in the team take care of at least one content-related task weekly. This is because we found out that content marketing not only makes Slidebean stay on top of mind of our target audience, but it also brings us a lot of high-quality revenue. I strongly encourage you to create a strategy first and then follow these steps. WHO WILL BE THE WRITERS? As we had defined 3 content verticals for our blog (Startup Insights, Slidebean Academy and Online Marketing), we took one each, according to our experience and backgrounds. HOW MANY NEW ARTICLES DO YOU PLAN TO HAVE A WEEK? Be realistic here. We decided to write 3 new articles a week, one each. Which means about 12 new articles a month. Not bad! WHEN ARE YOU GOING TO PUBLISH YOUR CONTENT? Our stats say that Monday, Tuesday and Thursday are the days with most engagement. So we decided those would be the days for publishing new articles, leaving Wednesdays and Fridays (and even sometimes the weekends) for recycled articles. Related read: How often should you post on Social Media? 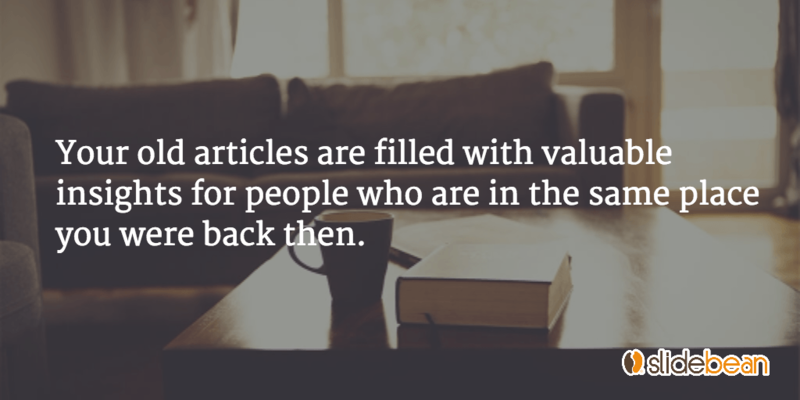 Blogging has the great benefit of providing SEO value. Any given moment someone could be stumbling upon a blog post you wrote months or years ago that ranks well in search. Let me share a great example of this. This blog post > 5 Tips for Using Parse with AngularJS was originally published in November 2013 and today (nearly 2 years later, wow!) it’s in the 8th position of landing pages with most sessions. And we’ve published tons of articles since. I wouldn’t try to hide something like this. On the contrary! We republished it recently and nearly tripled the traffic the article was generating on its own. Not bad for an old piece, uh? After finishing building our strategy, we found it essential to come up with a way to organise the work. So once again, we turned to our dear friend the spreadsheet, and named it Awesome content track, because it's pretty awesome. You can download it at the end of the article on the brown box (if you have trouble with this make sure to pause your ad blockers). First, you’ll need a Publish queue. It will be very useful to see what content is ready to be published, what has already been published, and where. We set up the rest of the sheets so they can feed the Publish queue automatically. You'll see. Launch > these are the channels where we need to publish the article as soon as it’s ready. Post-Launch > these channels are a bit less important than the last ones, so we take care of them after we finish launching the article, sometimes it's the following day. After one month > 30 days after launching the piece, we check out its results and republish it, but more on this later on. The second most important sheet will be ruled by the articles. 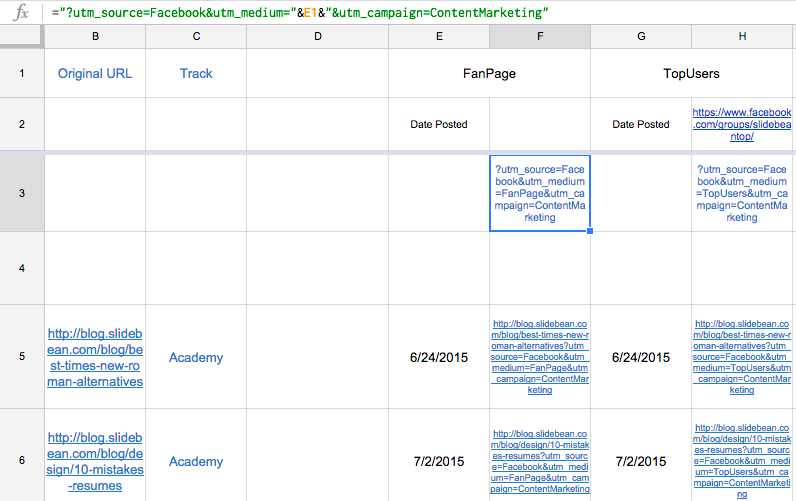 As your team writes the content, you should keep track of each article’s title, URL, owner, and estimate publish date. Subscribe link at the top and bottom > so that readers can get a weekly tip on the vertical they are interested in. Links to Slidebean that have reference to the blog > to know which users are coming directly from the blog we add this link when we mention Slidebean: http://slidebean.com?ref=blog. Links to related content > other articles from our blog that are related to what we are mentioning. Shareholic widget > buttons to share the article on social networks. ClickToTweet > we use this tool to generate links on specific quotes of the article, making it easier for the reader to share it. Google webmaster tools > it's good to make sure your content is indexed by Google, or else visitors won’t be able to see it in search results. We normally use the Fetch and Render option, and then Submit the URL to Index. I’ll leave you some help on this here. Sumome > we recently added this tool for the floating subscribe boxes. Those are the most important check ups we do, and as we take care of them we add an “x” to the corresponding cell. Once we’re done tuning up a blog post we write “Yes” in the “Ready to publish” column. That automatically makes the article available in the Publish queue and the cell next to it turns red, which alerts the team that something needs to be published! The rest of the sheets are meant for the channels where the content will be posted. Channels can include social media, your newsletters and other platforms. Given that for each channel you might have several "mediums", you’ll have more than one column in these sheets. For example, Facebook could include Facebook’s main page and some Facebook groups you’ve joined. Of course, you should only join groups that are related to your content verticals. The next part is really simple; as you and your team publish an article on the different "mediums" you should add the date to the cells in the column "Date posted". This automatically fills the corresponding cells in the Publish queue. Once every channel has a date, the cell that was red before turns green, meaning that everything has been published. We set up a different URL for each medium, so that we can later check out its results in Google Analytics. This way you’ll be able to discover, for instance, which Facebook group is giving you the most traffic. 1. In cell F3, write the channel’s name after "source="
2. In the same cell, write the campaign name after "campaign="
This should be the same for all of your links. In our case, it’s ContentMarketing. 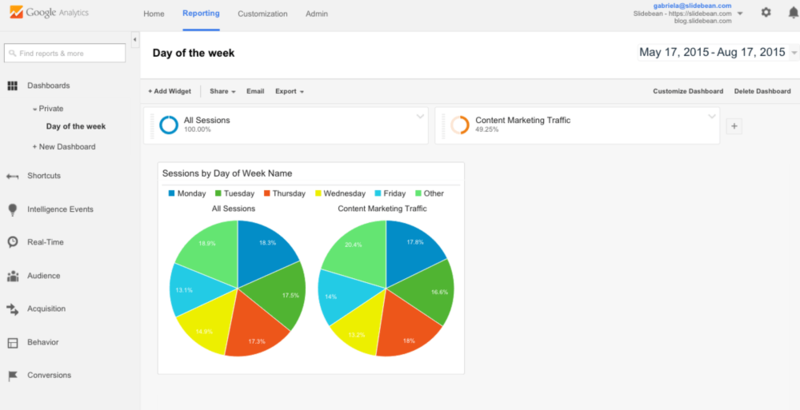 This isn’t mandatory, it’s just better for when you want to see the results of your whole campaign on Analytics. 3. Now go cell F1 and write the medium with no spaces, for example, FanPage. Done! Complicated? Not really. And the good news is that you'll only need to do this once for each medium. Then, each time an article is ready just copy the cell that has the complete link (in the image it would be cell F5) and post it on the specific medium. When a month has passed since the day that you first published an article, a cell in the Publish queue will turn red. This means it’s ready to be published again. Remember to check out the awesome tips of the Hubspot’s article I mentioned before. A good tip here, specially for Twitter, is to publish the same article using different quotes. A given part of a blog post might be appealing to some people, and others may be attracted by other insights. This will help you broaden the reach of the article. Building a strategy and keeping track of our content were both key to increasing our blog’s traffic by 110% in a matter of two months. Excited to find out about your results! Did you find this article useful? Help us spread the word!